Mugs by Lyla KaplanMusic & Mugs, an event hosted by Kennett Flash in Kennett Square, features lots of things Grid readers love: local drinks, local snacks, local art and local music. Use a handmade mug to sample beers from Victory Brewing Company while enjoying music from Hezekiah Jones, Chris Kapser, The Spinning Leaves and The Sisters Three. The ticket price also includes access to a spread of local cheeses from Highland Farm, Birchrun Hills Farm and Amazing Acres, as well as other light fare from Harvest Market Natural Foods. Proceeds benefit the Chester County Buy Fresh Buy Local program and the Chester County Food Bank (Formally the Gleaning Program). 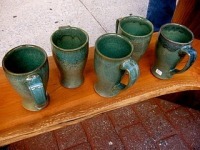 Local mug makers include Nell Hazinsky, Susan Bankert, Lyla Kaplan, Suzanne Kent, Pam Lau, Dan Ody and Jeanie Silver. For a longer run-down of event details, check out Inverbrook Farm's blog, written by farmer (and PASA insert celebrity) Claire Murray. Saturday, March 13. Pottery sales begin at 7 p.m.; music starts at 8 p.m. $20 in advance; $23 day-of.